From its $549 price tag to its freestanding, heavy-duty design, the Hover Helium clearly takes aim against the original Kangaroo "post-and-base" design. It has many of the Kangaroo's beloved features—simple, clamp-free installation; an expansive work surface; and a smooth, silent gas-assisted lift mechanism. But the Helium goes a step further by introducing a locking air cylinder attached to a Bowen cable to create a seamless adjustment method. Like the Kangaroo, and unlike some of the lower-quality entrants in desktop converter category, the Helium is a made in America. Unfortunately what it brings in ease of keyboard surface height adjustment it lacks in ease of monitor-height adjustment, requiring the user to go behind the unit and loosen two wing nights, adjust the height of the monitor manually, and re-tighten... such a pain that most users will leave the monitor at a sub-optimal height half the time. If that leads to users reluctant to stand due to neck strain that's a serious knock on the overall design. Locking air cylinder with Bowden cable lever. Work Surface: 28" x 13"
Shelf Surface: 28" x 11"
The Helium is easy to adjust up and down with one hand. Its locking air cylinder keeps the work surface in place without the help of any clunky knobs. Steel stabilizer rods built into the mechanism make it one of the more stable post-and-base workstations we've ever tested. Its slew of exposed screwheads and its fingerprint-collecting work surface leaves much to be desired. 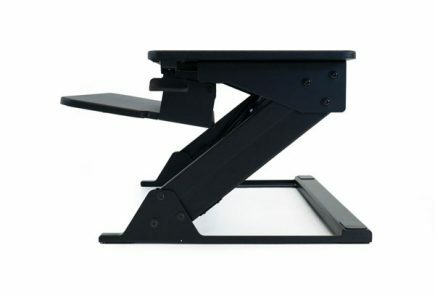 Its monitor height adjustment is precarious, very hard to adjust on-the-fly, and lacks its own counterbalance mechanism. Most users will get frustrated from the effort required to adjust their monitor height every time they stand and will probably leave it at the wrong height half the time. The Helium’s air piston column is relatively easy to adjust up and down, even with only one hand. Helium still has a few kinks to work out, including a very clunky monitor adjustment method that will frustrate users to the point of leaving the monitor at the wrong height half the time (either when sitting or standing). 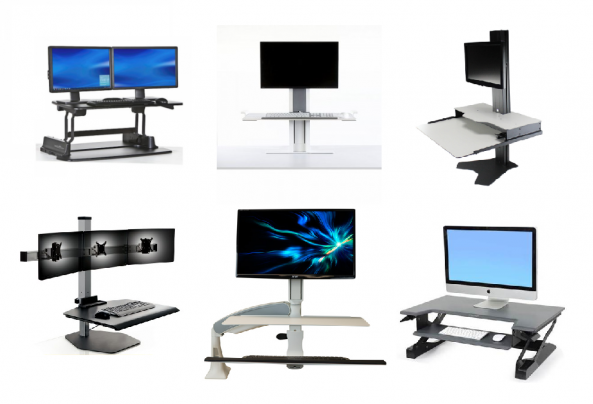 In the past few years, standing desk converters have experienced an explosion in popularity. 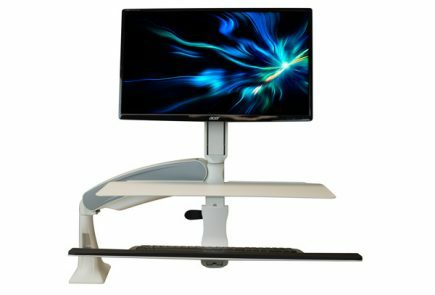 We're now seeing more and more standing desk converters in the arena, offering a wide range of solutions for office workers looking to transform their sitting desk into a sit-stand workstation. These new desktop converters often feature a host of design improvements—advanced mechanisms, greater height ranges and lift capacities, better ergonomics—that make it easier for users to work comfortably on their feet. There are now so many standing desk converters on the market, and we've reviewed so many, that we had to break them down in to six separate categories (see our comprehensive Standing Desk Converter Reviews round-up). If you're looking for a post-and-base style desktop riser be sure co consider the Helium Adjustable Workstation. It offers many of the same qualities as the dominant workstations in the market, and features a well-designed height adjustment mechanism that makes switching from sitting to standing a cinch—at least as far as the keyboard surface is concerned. Assembling the Helium is a relatively straightforward process. It has three main components to assemble: a work surface, a metal base, and a central column assembly with a secondary shelf surface built in. Attaching these components together involves a screwdriver; an Allen wrench; two dozen screws, nuts, and bolts; and some patience. The process took us 30 – 40 minutes, which included a few minutes of difficulty, as some of the Helium’s screws were poorly machined and had to be 'persuaded' into place with some elbow grease. Keep in mind we assemble these kinds of products here every day, so it might take you an hour or longer to follow the instructions and put your Helium together. Despite a couple hiccups, assembly was fairly easy overall. Like the Kangaroo and Winston before it, the Helium relies on its heavy base to keep it upright—avoiding the hassle of desk clamps and grommet mounts required for standing desk converters like the Workfit-S and Humanscale Quickstand. The Helium's locking air cylinder, and its accompanying Bowen cable and hand lever, arrive already assembled. This allowed us to sidestep a repeat of the frustrating and time-consuming experience we had trying to attach the Winston's Bowen cable to the air cylinder. The Helium takes its visual cues from other freestanding desk converters like the Kangaroo Desktop Riser and the Winston Standing Desk Workstation. A metal mounting column containing the height adjustment mechanism is the spine of the workstation. Attached to it is the Helium's work surface assembly, which consists of a main platform and a smaller shelf, as well as the Helium's height adjustment lever. The main work surface is 28” wide and 13” deep, while the shelf is the same width and 11” deep. The combined surfaces measure about the same as the Kangaroo's single surface, giving you more than enough room to take your desk top essentials with you to standing height. Unlike the Kangaroo and Winston, which have triangular work surfaces, the Helium is rectangular. This gives the work surface a larger area, but it also makes the Helium less compact and potentially incompatible with smaller cubicle corners. Affixed to the Helium's aluminum column is a mounting bracket that supports any VESA-compatible monitor. A heavy base keeps the entire workstation upright and secure on top of your desk. The base is dense enough to provide plenty of support for the column and work surface, but measures just 17" x 17.5", so it can work with desks as narrow as 24" deep. The Helium’s aesthetic is Spartan at best. Its work surface and shelf platform do nothing to conceal over a dozen screw heads which, while flush with the platforms, are nevertheless clearly visible, giving the Helium a bit of a garage workshop look. The work surface has an unfortunate tendency to collect fingerprints, and the Helium comes in only two colors: black base with black work surface, or silver base with white surface. It's a utilitarian aesthetic, especially compared to more design-oriented standing desk converters like Humanscale's Quickstand or the Winston. From an aesthetic standpoint, the Helium's saving grace is its comprehensive cable management system. The front face of the top shelf is equipped with six cable pass-through holes, with plenty of space to accommodate all your equipment's cords. A vertical cable guide along the back of the mounting column keeps your monitor cords neat and orderly. Cable management is too often a low priority for desktop risers, but they are essential for maintaining a tidy work surface and keeping your equipment safe from snagging cords during height adjustment. They're especially important the more monitors you work with and the wider your work surface, since presumably you can fit more electronic equipment on top. Cable management is nice, but the Helium's strongest feature and biggest innovation is its sophisticated height adjustment mechanism, which is similar to the pricier Winston's. The prevailing height-adjustment mechanism for post-and-base standing desk converters is a gas-assisted or counterbalance system. Gas-assisted workstations have greater weight capacities, but require knobs or brakes to keep the work surface in place once you find the height you want. Counterbalance workstations adjust quickly and easily, without knobs or brakes, but tend to have lower weight ratings and less stable work surfaces—it's not uncommon for eager typists to gradually, unintentionally move the work surface lower as they type. To solve both of these problems, the Helium uses a clever height adjustment method that’s both stable and easy to adjust. This uncommon mechanism uses a gas-assisted cylinder to make adjustment easy, but includes a locking mechanism controlled by a Bowen cable, just like the ones that control your bicycle brakes, to keep the work surface stable. A hand lever atop the Helium’s work surface just underneath the shelf platform engages the cable, which actuates the cylinder and allows you to change the surface height. Releasing the lever halts the flow of air in the cylinder, effectively locking the work surface in place. It's far more efficient than fiddling with cumbersome knobs, but still maintains a higher weight rating and greater lift capacity than counterbalance systems. We first saw this kind of mechanism on Innovative’s Winston Workstation, but the Helium’s implementation of it improves upon many of the hang-ups that hampered the Winston’s design. The Helium’s hand lever is more accessible to the user and feels more natural to press than Winston’s sliding button, which was difficult to press unless you gripped the work surface just right. The Helium also adjusts more smoothly than the Winston. The latter of the two often required users not only to press the height adjustment button, but to use their other hand to pull up or push down on the work surface. The Helium has a magically easy height adjustment. You simply press the lever with your thumb and, with the same hand, grip the work surface to raise or lower the height. It's an effortless adjustment method that can be done with one hand. Even putting the adjustment mechanism aside, the Helium still boasts some impressive capabilities. Its work surface can reach a maximum height of 17 inches, matching both the Kangaroo and Winston's height range. The standard Helium model has a 12lb. lift capacity, but an additional $40 nets you a heavy duty model capable of lifting 30 lbs. You can set your monitor to a maximum 22 inches above the shelf surface, which is much higher than the vast majority of workstations. The Helium features your standard monitor tilt and rotation capabilities, though the monitor can't pan left or right. Stability is always a concern for stand up desk converters, particularly those that rely on a single mounting column, since the work surface usually exhibits some amount of shakiness. Amazingly, the Helium had some of the least wobble we've encountered in a post-and-base sit stand workstation. Even without a stabilization leg like the one the Kangaroo uses, the Helium’s work surface was nearly as solid. We didn't experience any of the work surface flex or shakiness inherent to the majority of desktop converters on the market. One key area where RightAngle made some design concessions, however, is in the Helium's monitor height adjustability. Unlike workstations like the Kangaroo, Workfit-S, or Quickstand, the Helium doesn't have a dedicated gas-assisted or counterbalance mechanism for its monitors. This secondary mechanism is what separates the good desktop converters from the best, and many otherwise great products have fallen short for lacking this feature. These monitor height mechanisms are necessary for two reasons. First, the amount of space you need between your monitor and your work surface is unique to you, and second, because the amount of space you need is usually greater by a small but noticeable amount when you’re standing. Standing desk converters like the Kangaroo make it very easy both to set the monitor where you need it, and to make necessary, minute monitor height adjustments on the fly. Despite not having one of these mechanisms, the Helium refuses to go down without a fight. Its monitor bracket sports a tilt-and-lock design that allows you to adjust your monitors independently. A set screw is installed at the bottom of the plate where the bracket meets the column. T-screws on either side of the bracket tighten to lock the bracket in place. Ideally, adjusting your monitor is simple. You loosen the T-screws on either side, and the set screw would keep your monitor from plummeting to its doom with the power of friction. You tilt the monitor up to lift this set screw, raise or lower the monitor to your desired height, and let go, remembering to tighten those T-screws again. We were initially skeptical, and while we've verified that it works, we can't say it works well. Loosening two T-screws to even start raising the monitor is a cumbersome and, since the T-screws loosen by turning in opposite directions, confusing step. The bracket also feels shaky during height adjustments, and you can hear it scraping against the metal column as you move it. Most importantly, the lack of a counterbalance or pneumatic cylinder means that you're lifting the full weight of your monitor—or monitors, if you get the dual option. Lifting 10 – 20 lbs. worth of monitors several times a day can get old fast, and we much prefer the assisted monitor lifts of other standing desk converters. The challenge is you have to stand behind the unit to maneuver the monitors, which may not be possible if your desk is up against a wall. And the walk around the desk might be an encumbrance to people bothering to properly re-adjust they monitors' height every time they want to stand—leading to inevitable neck strain. The Helium clearly has some strengths. It's made in America. It's remarkably easy to move the work surface up and down with just one hand, and it's one of the more stable post-and-base designs (certainly better than the Kangaroo or the Victor). Aesthetics are spartan, with exposed screw heads and a paint finish that loves to retain fingerprints. The monitor adjustment height is the Helium's true shortfall. 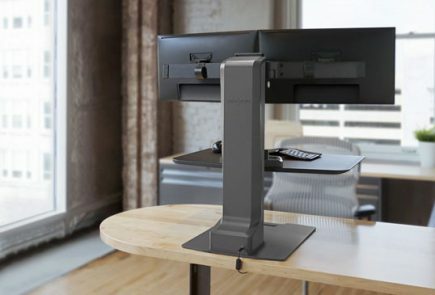 It is so cumbersome as to cause concern that users simply won't both changing the monitor height every time they stand, leading either to neck strain or to less standing time for the user. The taller the user, the more this will likely be a problem for them.